Computus' (the Latin for computation) is the calculation of the date of Easter (which varies from year to year), which was complicated partly by the fact that the date was originally dependant on the Jewish rather than the Christian calendar. A number of treatises were written on the subject, notably by 'the Venerable' Bede. Tables were also drawn up, in which one could look up the date of Easter for any given year. At the end of this manuscript are a series of annals, probably originally written in about 1244, starting with Christ and ending in the year 1243, with additions extending to 1362, many of which relate to Abbey Dore in Herefordshire, where it was doubtless written. 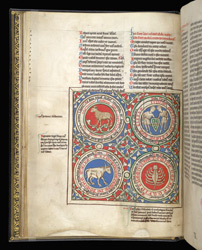 The large coloured drawings on this page represent the zodiac signs for Aries (the ram), Gemini (the twins), Taurus (the bull), and Cancer (the crab).